• Whale Watching and Sea Kayaking – Combining both snorkeling and kayaking, this trip explores the Sea of Cortez, which includes the marine park that is located off the coast of Loreto. Adventurists love the thrilling sights of Pacific Gray Whales arriving fresh from the Arctic’s icy waters and giving birth in the warm waters of the Pacific’s Baja area. With a safari-style camp that nestles closely into the remote island’s dunes, experts offer daily excursions that offer visitors the ability to get up close and personal with whales. This breathtaking 10-day adventure begins in La Paz, ultimately having visitors arrive in Sur, Mexico. The trip includes a sea kayak orientation, bird watching and beachcombing. • Island Hopping – This trip highlights exploring the vast beauty of the Sea of Cortez, combined with desert island hopping. This trip highlights 10 different Baja islands, offering camping on five. An expert guide via motorized boat coordinates travel in between islands. The islands can be explored via snorkeling, kayaking and on foot. This trip is superb for families and offers a multitude of viewing opportunities for marine life, serene beach coves and inviting warm ocean waters. This nine-day trip highlights hiking, fishing, kayaking and snorkeling. This trip includes visits to the following islands: Espiritu Santo Island, San Francisco, Los Isoltes, San Jose, Puerto Gato, Santa Catalina Island, Monserrat Island and Danzante Island, to name a few. • Espiritu Santo Island – Whether it’s a novice or an advanced sea kayaker, this vacation is a paddler’s dream. Combining wildlife viewing and oceanic adventures, this kayaking and camping trip explores the unique, raw wilderness of Espiritu Santo Island. Highlighting canyons with tropical fig trees, white sandy beaches, boulders and snorkeling among tropical fish and sea lions, this trip is simply spectacular. This eight-day trip highlights hiking, fishing, kayaking and snorkeling. Campsites are located in protected areas on the east side of the island. 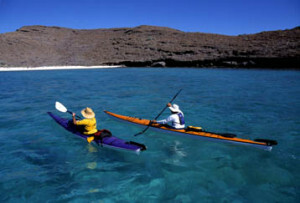 • Baja Coast – A paddler’s paradise, this trip is ideal for sea kayakers of all skill levels. With warm 80-degree Fahrenheit waters, snorkeling is pleasant. Spring trips are especially popular as the waters are calm and serene, featuring migrating whales. This trip begins in Loreto, B.C.S., Mexico. The total trip is nine days. Kayaking varies between eight to 20 miles per day and this trip offers overnight accommodations. Holiday River Expeditions offers family rafting trips, including individual excursions for advanced adventurists. These rafting vacations make an excellent gift for the holidays, giving recipients an opportunity to look forward to outstanding outdoor adventures well into next year.